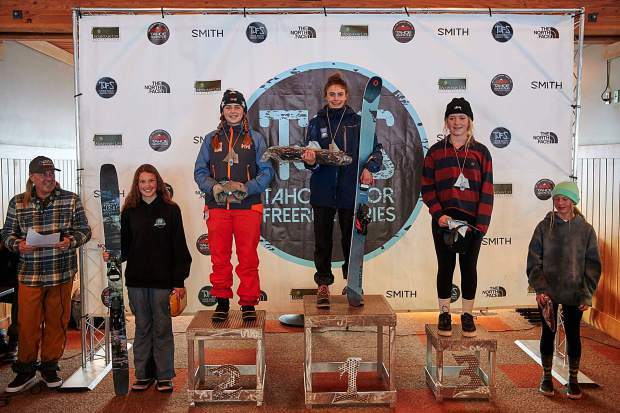 The Sugar Bowl Ski Team & Academy excelled last weekend at the inaugural 2019 Tahoe Junior Free Ride Series event at Sugar Bowl Ski Resort’s Disney Nose. Standout performances by athletes in every category showcased the team’s dedication and hard work through the beginning of the season as each run exemplified solid technical skiing blended with aggressive line choices. On Saturday, the team’s Hayden McJunkin stood atop the girls’ 12-14 podium with a dominant run followed closely by teammate Eliza Gould nabbing second. Aggressive runs were delivered by Isabel Delen (12th) and Maya Lenkov (14th) as well. Cole Davidson in the boys 12-14 category earned a third place finish with a lightning fast run off the dead tree air. Sam Martin gave the spectators a good show and grabbed a sixth place finish. The boys’ category was a stacked field and judges rewarded strong fall line skiing. Notable runs from Caelan Diermann (11th), Jack Knight (16th) and Bryer Chalstrom (19th) rounded out Sugar Bowl’s top 20 boys. Sunday brought fierce competition from the boys and girls, aged 15-18. Senior Jordy Guldman delivered an impressive run blending his signature technical skiing with freestyle prowess delivering him to a fourth-place finish. Miles Hardacre blasted down the venue on a creative line scoring him the number 15 spot. The boys from Sugar Bowl clearly demonstrated their talent with Kris Roos (17th) Peyton Worthington (30th) and Travis Schaffer (31st) putting down impressive runs as well. Representing with a fluid run, Tallulah De Saint Phalle finished on the girls’ podium in third place. Kailey Schantz delivered a fall line attack that earned her a well-deserved fifth-place finish. Aggressive skiing by the Sugar Bowl girls paid off with notable finishes from Momo Lloyd-Tucker (seventh) and Elizabeth Howard (ninth). Most notable throughout the weekend was the positivity charged attitudes that all the athletes brought to the venue. The Sugar Bowl Ski Team and Academy will be competing at Kirkwood Mountain Resort on Feb. 2-3, for stop two of the free ride series.